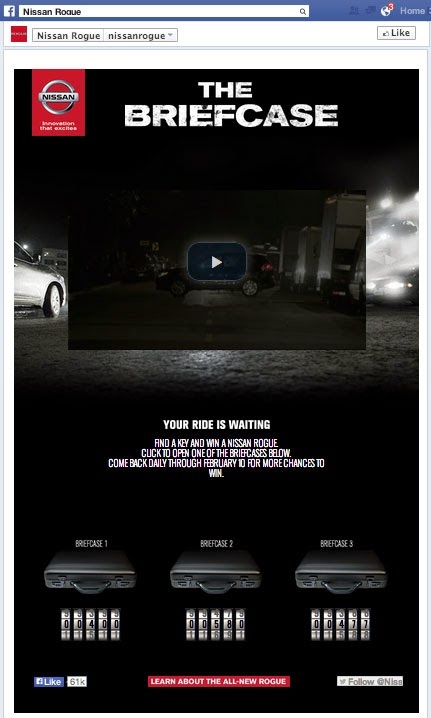 Nissan's latest campaign to market the Nissan Rogue is brought to life in a two and a half minute online video. It begins with a guy needing a ride that he calls up using the ride service Uber. A very attractive Uber driver shows up in the new Rogue and proceeds to drive him to his destination when all of a sudden a motorcycle pulls up next to them and gives the Uber drive a metal briefcase. The light changes and the action begins with exploding cars, wrecked motorcycles, and a startled unsuspecting backseat passenger. The spot is a bit hard to follow in the 60 second TV version, but for those who are interested in wanting to know more the spot ends with a call to action to the website OpenTheBriefcase.com. 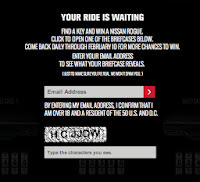 The website is a Facebook tab on the Nissan Rogue Facebook page. Fortunately, the team was smart enough to not force someone to Like the page to engage with the content. Once there, a short 40 second video exposes what's in the briefcase. Spoiler alert. 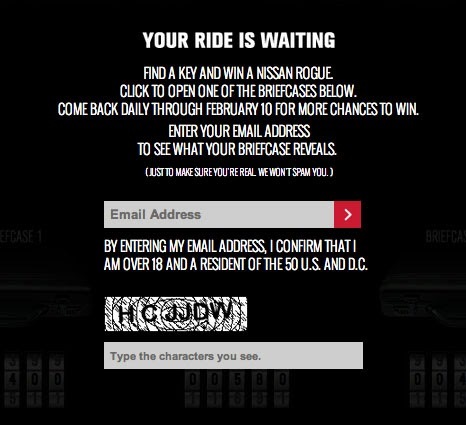 A key to a new Nissan Rogue that three people can win. Basically all you do after watching the video is enter your email and click on one of three briefcases. I clicked on one and it zoomed in around it and then said I had another chance to win on another day. Personally I was confused as it wasn't clear what just happened, other than viewing a corner of a briefcase image at a higher zoom. Not much of an interactive rich experience. Too bad, as the video is compelling, too bad the user experience is less than interesting. 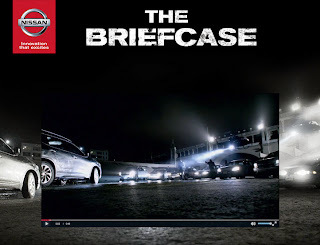 With all the action of the video and the focus of the three briefcases, the Nissan Rouge is a bit lost in all of it. Maybe shooting the action video in daylight would've showed off the vehicle more as the dark night and black Rogue disappear in the darkness, literally. Audi just launched their latest campaign promoting TDI Diesel vehicles to Americans. It's definitely not their first attempt to raise the profile of diesel in a market where gas prices are still in the $3-$4 range and more and more options such as hybrids, electric and high-mileage gas cars continue to provide choices for the fuel conscious consumer. The latest campaign features actor Claire Danes in an Orange is the New Black prison inspired theme where Danes has her name mispronounced as the running joke in the long form ad. She imagines travel to an award show with a chauffeur. Or what a drive would be like solo in the new Audi A6 TDI. All of it ends in the ability of the Audi to drive 700 miles using one tank of gas. It's a long three plus minutes to get to the final payoff with lots of beauty shots of the Audi driving the open road. 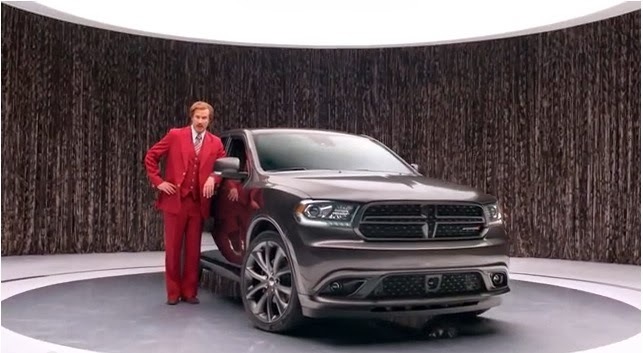 Unlike a lot of fuel saving vehicle ads there is no information about how many MPGs the car produces or what benefits diesel may have over other fuel economical cars, just that it's better than driving with an odd over-sharing limo driver. Today's Business Insider wrote about Audi ignoring the easy way to promote diesel, inspired after sitting through this celebrity inundated commercial. The writer suggests Audi should dump the ambiguous "TDI" nomenclature and just tag the cars as "Diesel" on the car itself. This simple move would show that diesels are quiet, attractive, and not smelly. Personally, I like the ad "The Station." While it may not promote solid MPGs or tell me why I should buy TDI over EV, PEV, or a Hybrid, it definitely is memorable and tells me Audi makes diesel cars, not that an automotive enthusiast needs a reminder. So what do you think? Do you like the Claire Danes ad and Audi's latest approach to selling diesel? On Monday July 15th, Honda launched a social media campaign using the short-form video application Vine as a way to reach people expressing their frustrations with their current car. 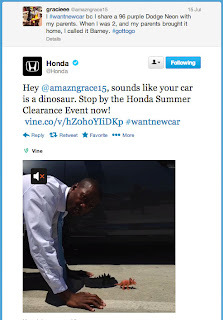 They noticed a lot of people in social media share their daily vehicle problems, which could open up an engaging opportunity to help promote Honda’s Summer Clearance Event. Prior to the day, they shared this video promoting what the social media team intended to do. 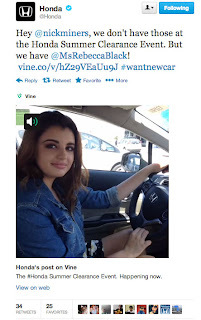 Basically they would respond to people with car issues by creating a 6-second Vine video using the hashtag #WantNewCar. Monday came and Honda created several Vine videos showing dealership sales people in khaki pants and blue shirts filming whimsical videos at Honda dealership. They responded in the following way with people in need of a new car. 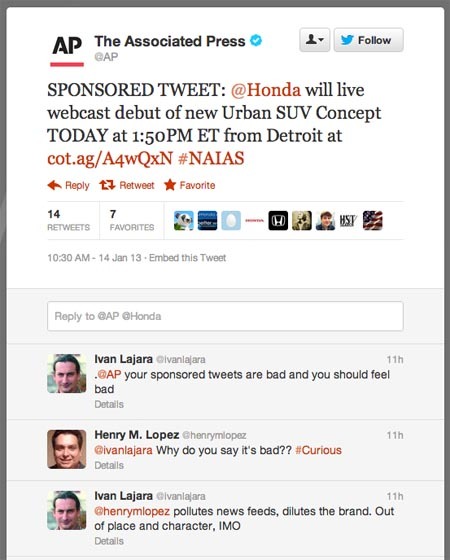 So how did it do as a way to increase social conversation for Honda? The following three charts show a couple things. The first looks at the use of the #WantNewCar hashtag, with most of the activity coming from the paid Promoted trend on Honda bought on Twitter July 15th. 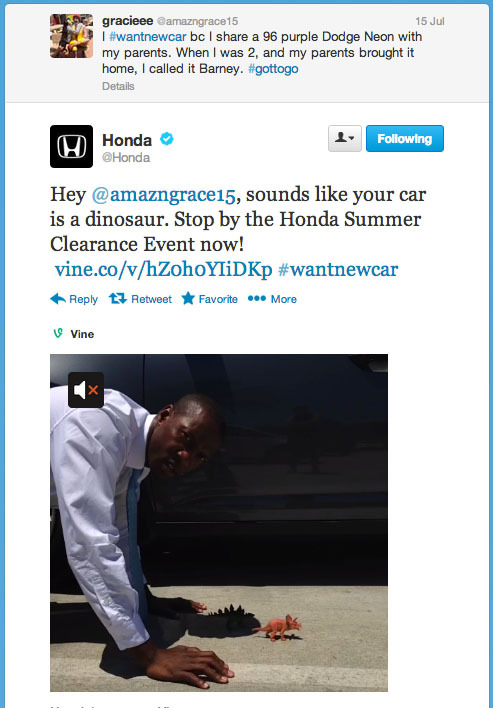 The second chart looks at mentions of “@Honda” to see what kind of lift came from people talking about the brand account or retweeting content from the campaign. 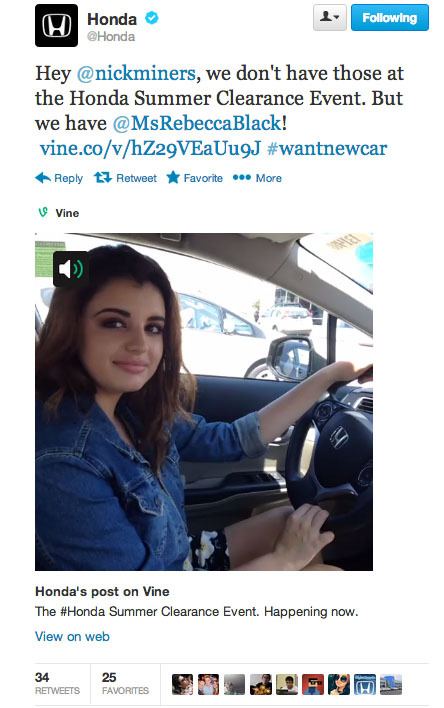 The top piece of content shared was this Vine using YouTube sensation Rebecca Black that received 34 retweets and 25 favorites. The third chart looks at overall mentions of “Honda” in the last 6 months. Ignoring the April spike due to the Boston Police looking for a Honda sedan at one point during the bombing manhunt, the conversation around Honda didn’t really move much and was normal during this past week’s vine event. 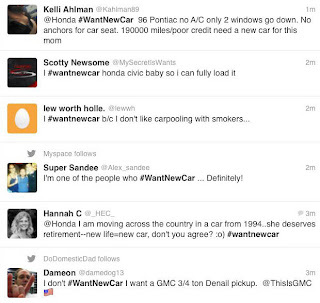 This comes as no surprise as a lot of engagement on the #WantNewCar hashtag focused more on people wanting some other car than a Honda; though, quite a few people did ask Honda for a free car. Last 6 Months Tweets Mentioning "@Honda"
Last 6 Months Tweets Mentioning "Honda"
The campaign did provide some decent lift and received positive response from media and social media fans. 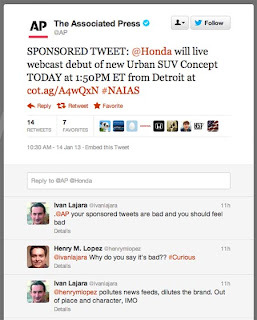 Plus it’s a fun creative execution that tried to engage Twitter users in a playful way. That said, the hashtag might have been more of an issue with this campaign. The night of the event I followed the conversation closely and came away with three common responses from the online community. 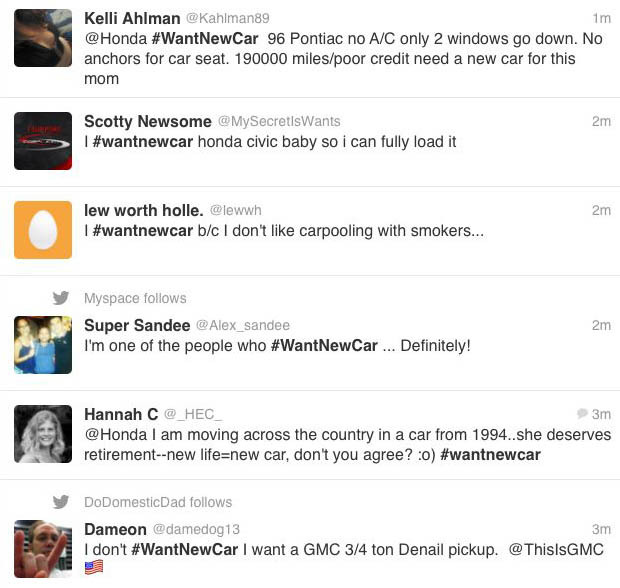 Most people who engaged with #WantNewCar thought Honda was asking them to share a negative experience with their current car (or lack of owning a car) so that they could win a free car from Honda. Those who were hoping for a new car for free asked more often for something other than a Honda. Pick your favorite aspirational sports car and that was likely what people were tweeting about. 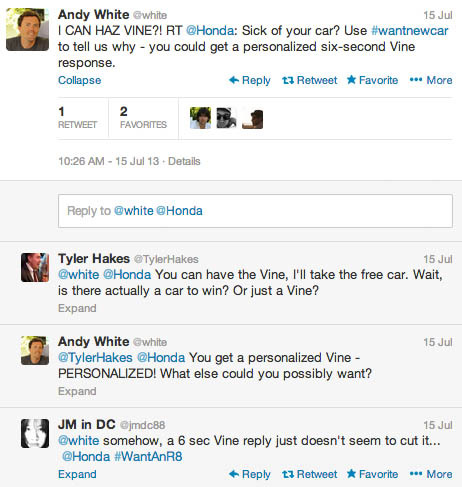 Finally for those who found out that they were not getting any possibility of a free car, and may only get a free vine video, well that didn’t go over so well. And while the Honda Vine videos were not as revolutionary or compelling as some other campaigns, the company did recently release this brand video showcasing Honda’s history in a fascinating way. I woke up this morning to a pitch on my twitter account. Unlike most 'hey can you post this on your blog,' requests this one is pretty good. 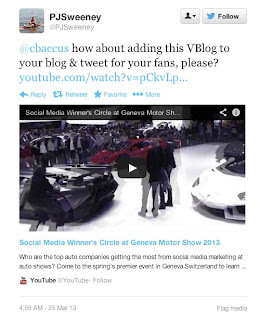 There are some good examples of social media activations happening at the Auto Show including uses from Nissan, Hyundai and Mercedes-Benz. There's even a little dig at Citroen who allows for email sharing only on a build application they have on the floor. Anyway, thanks to Patrick Sweeney for some good content. Oh and here's the pitch (and yes I'm following @PJSweeney now on Twitter. There was an interesting revenue tactic last week by the Associated Press when technology company Samsung advertised on the AP's twitter feed during CES. AdWeek immediately covered the story, since there is some discussion about AP blurring the line of between "editorial church and state." Another week and another big industry event, this time the North American International Auto Show (NAIAS) in Detroit and sure enough the AP's Twitter account is again posting sponsored tweets this time for Honda and Acura. 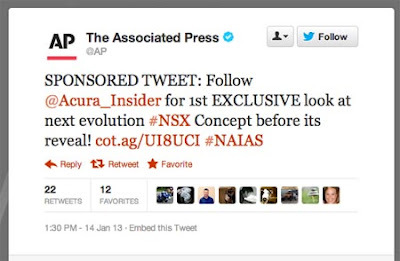 Both posts featured the upcoming concepts the brands were featuring to interest AP's 1.5 million twitter followers. This is an interesting tactic since one can assume a lot of media from other publications follow AP on Twitter. If a brand can get their news to journalists in a quick way through what could be seen as a target media buy to a difficult to reach audience - reporters, this may not be all that bad of a tactic. Unless it backfires as crossing some line as some commenters on Twitter have expressed. What will be telling is how long this lasts. It could be seen by Twitter as a challenge to their own advertising model. If Twitter accounts start selling their tweets directly to brands, this could usurp some ad dollars from the company providing the community and with a looming Twitter IPO on the way this probably won't last long. If you want to hear some more on this topic, checkout this week's BeanCast Marketing podcast that I was a panel member on. We discuss this topic in depth as well as several other current marketing and social media topics. Ever wonder how you rank with a brand's "official superfan" on Facebook? Yeah me neither. 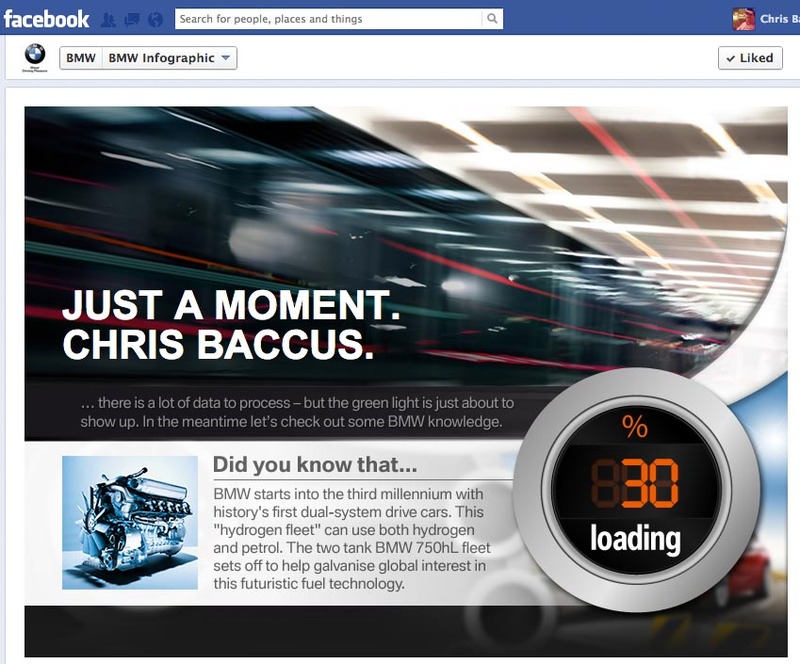 Regardless, BMW brings its fans the opportunity, through a Facebook data generated personal infographic, to see how superfan they are. 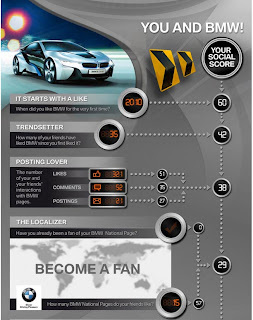 The BMW Infographic application showcases several key stats for their Facebook fan page including the most viral post, most popular video, and a tag cloud showing popular words used by fans: Love, Nice and Awesome top the list. The application entices fans to create their own infographic to see how they rank against Todor Todorov, someone the BMW social media team has identified as the "Official BMW Superfan." At the end of the personal generated infographic fans can see how they score against Todor. I wasn't too far from making superfan status generating a score of 217 vs Todor's 295. If only I liked more International pages or liked a few more BMW posts, superfan status could be mine! What the infographic does well is give fans a desire to become more engaged fans. The whole idea of making it a bit competitive is to show how fans can be more engaged with BMW by liking more BMW fan pages and showing how engaged a person is with BMW content on Facebook. More engagement equals higher scores. There are a couple misses though with the application. First of all, one can only share the application as a shared link that brings others to a person's created infographic on the application tab. It seems an image of the infographic would've been a better solution, especially since mobile still lacks support for Facebook tabs and you get comments like the one I received from a friend, "Link didn't work for me." Also if the generated infographic was an image, it could be shared on other websites, social sites, or email. Unfortunately, the infographic doesn't have a similar viral impact of say Intel's Museum of Me which did some similar things; though, to be fair, the Intel idea requires significantly more budget to do. Intel created a personal video that brought people's Facebook content into a museum like walkthrough. Perhaps a personal museum of BMW content shared by the person and their friends could showcase interaction with the brand in a more interesting way than an infographic. Overall the idea here is a good one and it's great when brands use their fans' Facebook content in a way that relates past interaction in a way that tells a story.